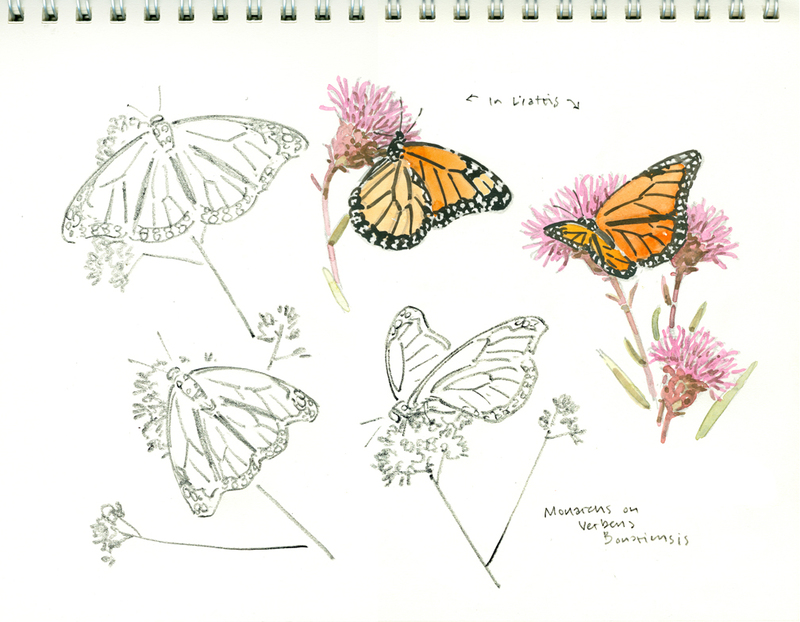 Posted on December 7, 2017 by Barry V.
During the record-breaking winter of 2014/15, Amy Montague and I hatched a plan for a special kind of Artist Residency, during which I would travel around Massachusetts to visit and work at Mass Audubon’s wildlife sanctuaries. The contract we agreed upon specified that I visit at least 45 sanctuaries, but in the back of my mind, I knew I wanted to visit all 57 public properties. What I didn’t know was how long it would take. 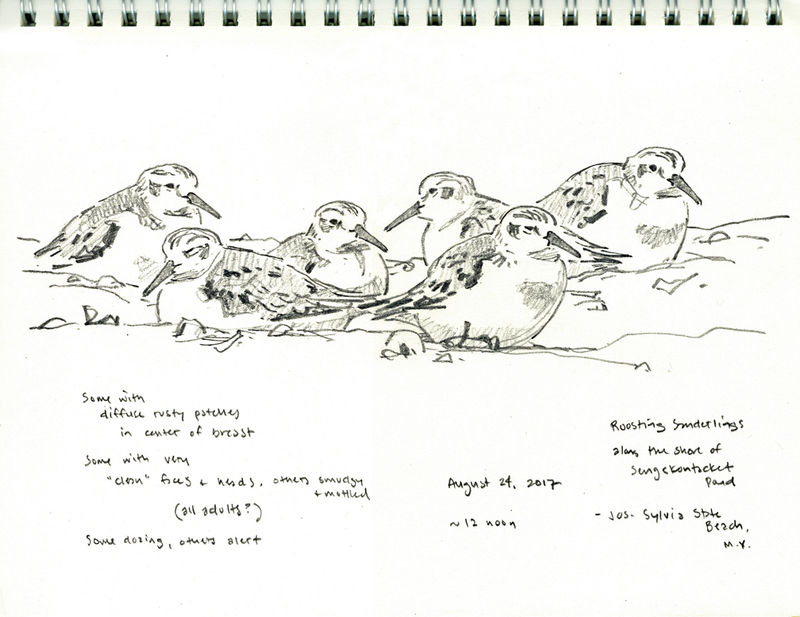 We settled on a two-year timeframe, wrapping up with an exhibition at the Museum of American Bird Art in Spring/Summer 2017. 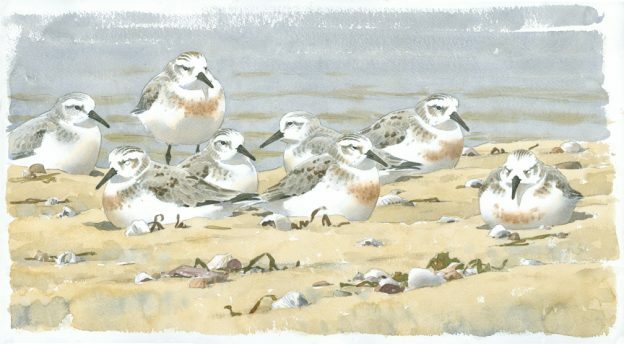 By the time my show opened in May 2017, I had worked at 52 sanctuaries, leaving five properties yet to visit. There was no reason to stop, now! Flash forward to the morning of August 22, 2017. I’ve been stuck in traffic for over an hour on the Bourne Rotary, waiting to make my way across the Bourne Bridge and then on to the Martha’s Vineyard Ferry at Woods Hole. I thought I had left myself plenty of time to make the ferry, but unbeknownst to me, an accident on the Sagamore Bridge earlier that morning had redirected all traffic over the Bourne – resulting in this horrendous traffic snarl on a Tuesday morning! 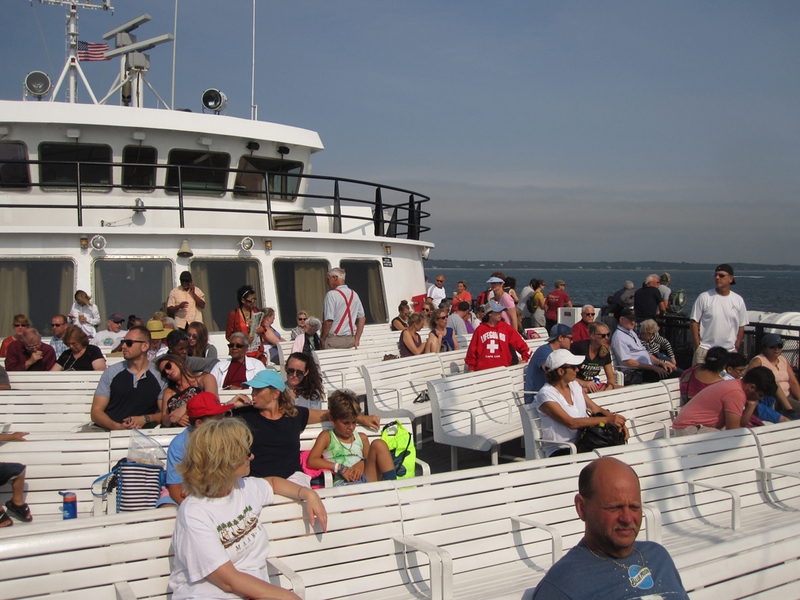 As it happens, I did make the ferry that morning – arriving last in line and just in time to get on the boat. My final sanctuary visit, to Felix Neck Wildlife Sanctuary, was underway! The first thing that caught my eye as I arrived at the Felix Neck parking area, was a large, strangely proportioned birdhouse mounted on poles. 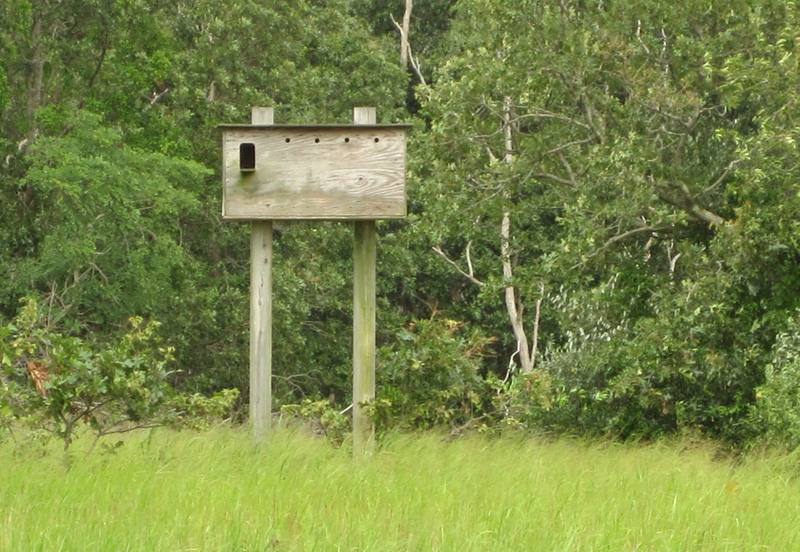 The structure had been used by Barn Owls for many seasons, but has had no owls in residence for the past three years. Barns Owls are at the northern edge of their range in Massachusetts, and in recent decades, Martha’s Vineyard has been the most reliable breeding locality for these birds (nine pairs nested on the Island in 1985). Unfortunately, they are vulnerable to severe winters with heavy snow cover (such as the winter of 2014/15). One can only hope that they will re-colonize the island in the near future. The Felix Neck Wildlife Sanctuary is a roughly 200 acre neck of land surrounded on three sides by the protected waters of Sengekontacket Pond. The Pond itself is separated from the ocean by a narrow barrier beach comprising the Joseph Sylvia State Beach (more on that to come). 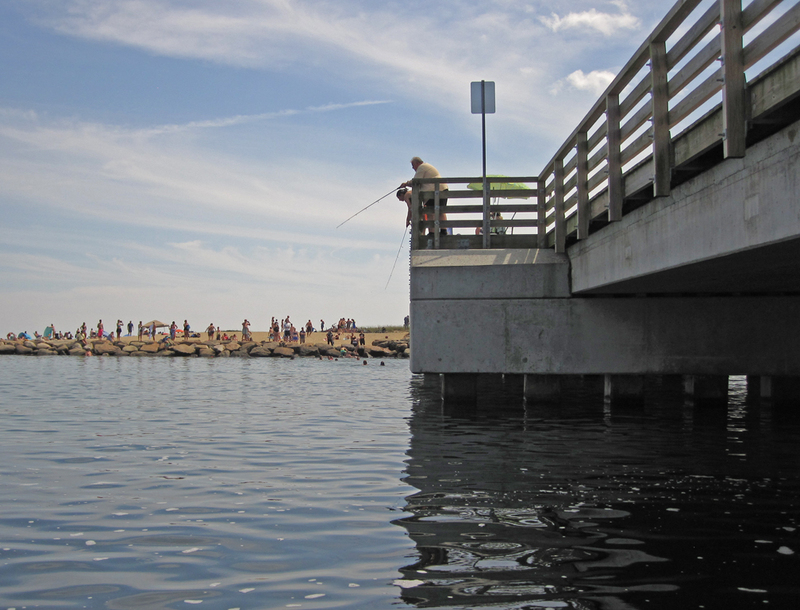 Ocean waters pass in and out of Sengekontacket Pond beneath a bridge on the state beach known locally as “The Jaws Bridge”, since it figured prominently in some scenes from the movie JAWS! Sharks were far from my mind, however, when I set out on the Marsh Trail to explore the sanctuary. A green heron skulked along the edge of the waterfowl pond, but flushed when I took out my sketchbook. 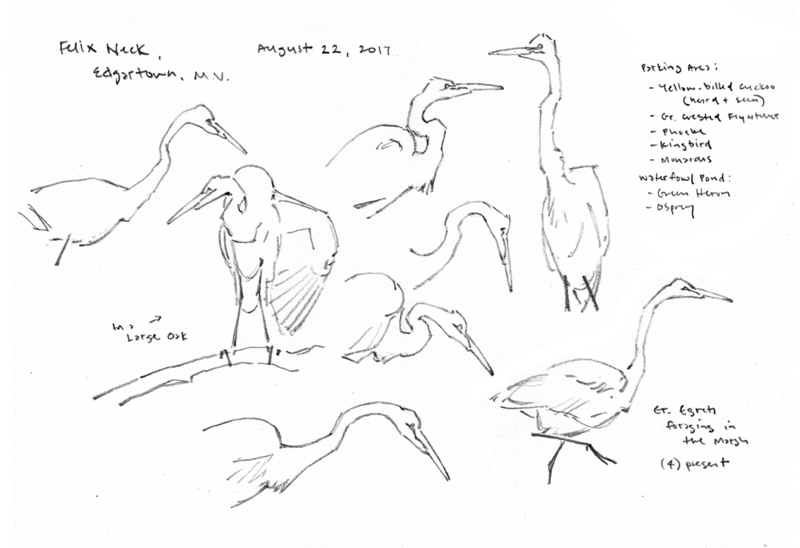 Further out on the marsh, some Great Egrets were more cooperative, and I spent some time mapping out the odd angles formed by those impossibly long necks. 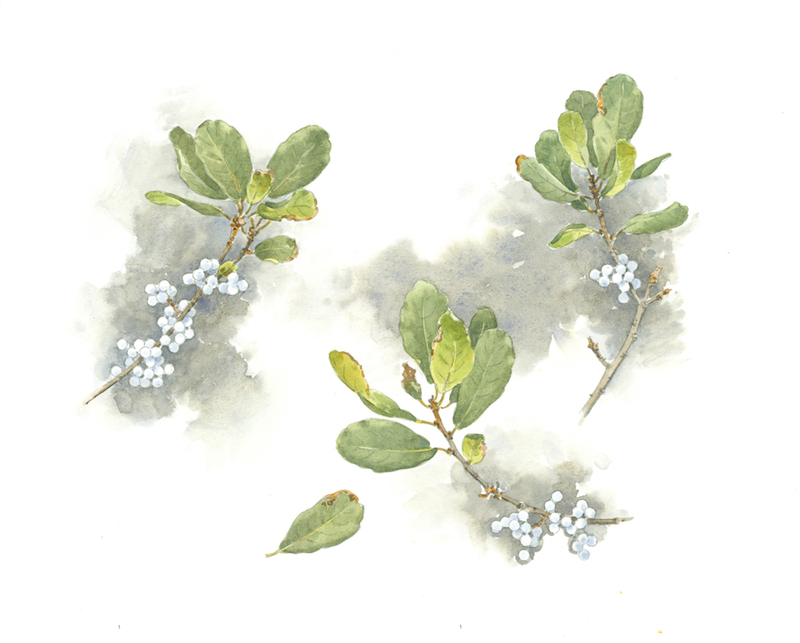 Along the Marsh Trail, pitch pine forests border the marsh, with an understory of huckleberry. 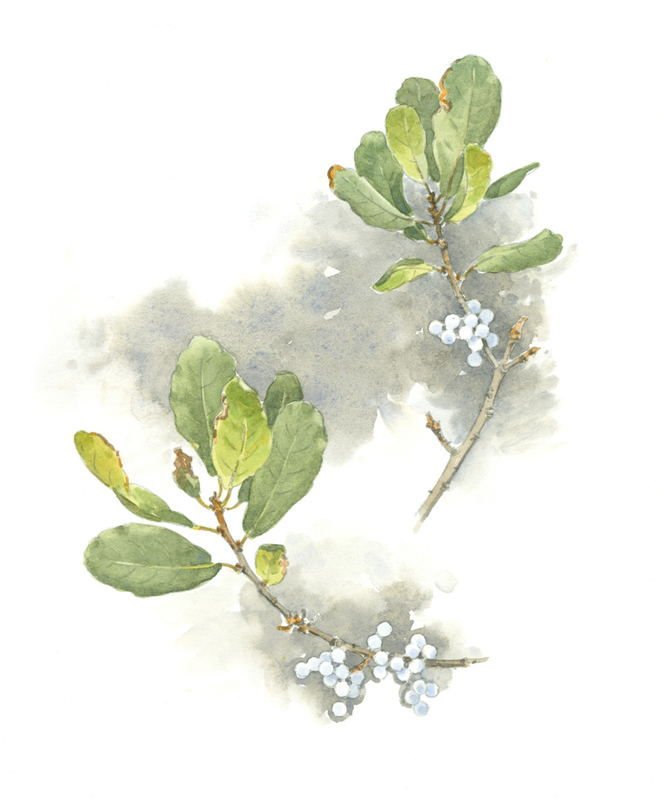 Where the forest gives way to the open marsh , “high tide bush” (marsh elder) forms tall, billowy shrubs. 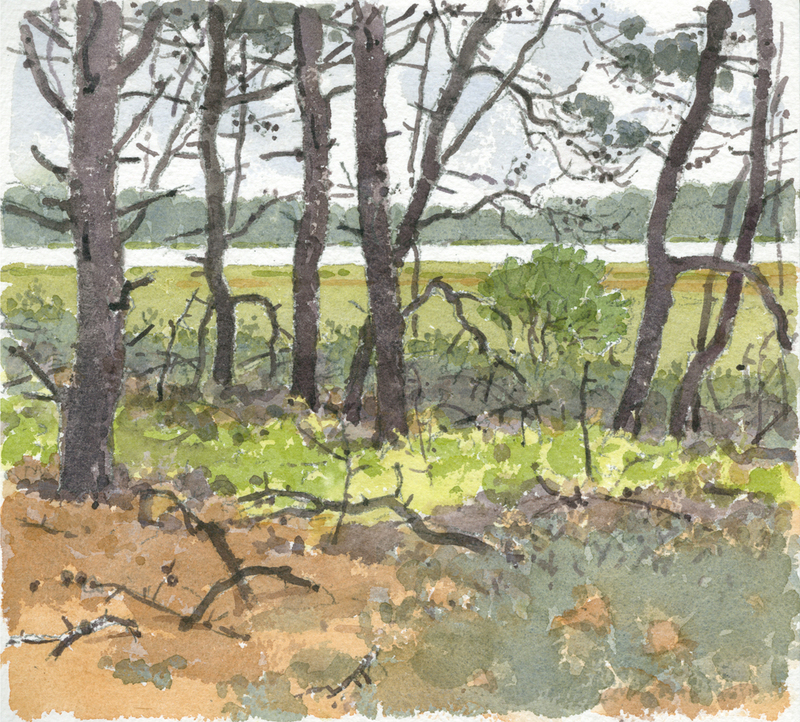 I like the way the waters of the marsh form a bright, level ribbon beyond the pine trunks and branches, and get to work on a watercolor. 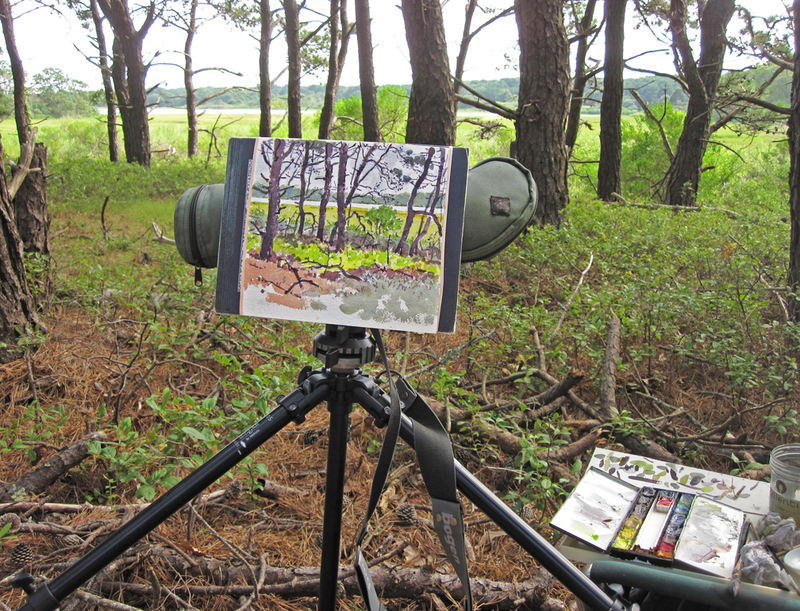 I use a small sheet of Arches 300 lb cold-press that is just right for painting the roughly textured pitch pines. There’s a gracefulness to the curving sweep of some of the branches, but there’s awkwardness, too, in the chaotic angles and weird undulations of the trunks. I find this intriguing – the graceful and the ungainly mixed together. From a spur trail that leads out to the shore, I have a view of Sarson’s Island across the water. It’s labeled as a “bird nesting colony” on my trail map, so I scan it slowly with my scope. 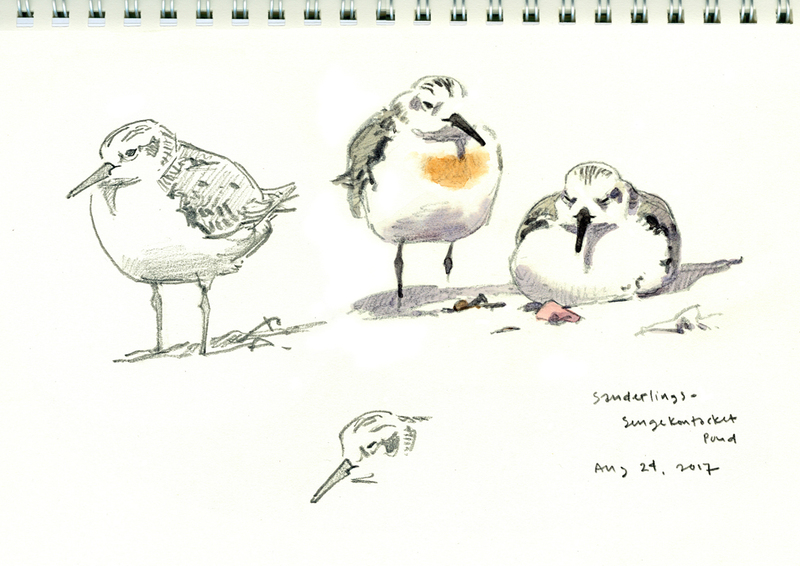 I see mostly cormorants and gulls, but mixed in are oystercatchers, plovers, turnstones, dowitchers, willets and peeps. 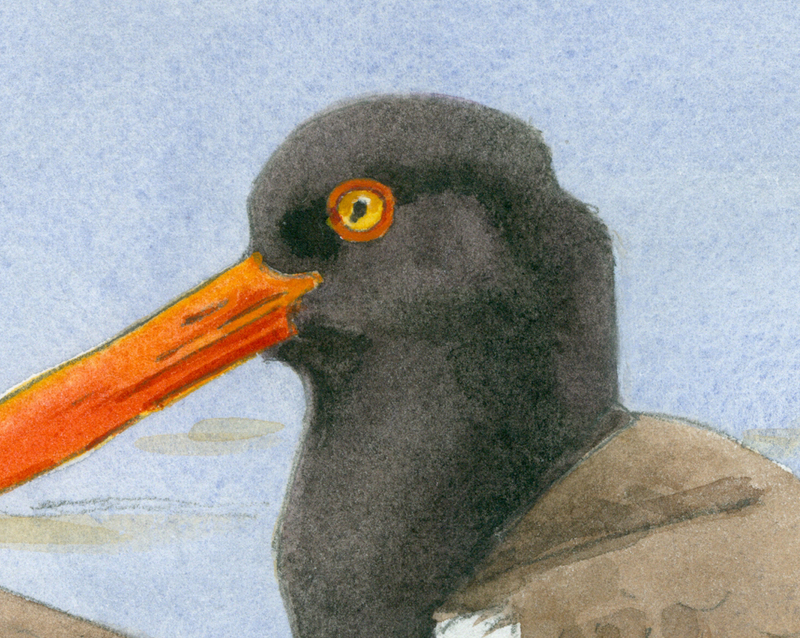 A small flock of Black Skimmers flies past the island and I follow them out over the waters of Sengekontacket Pond. 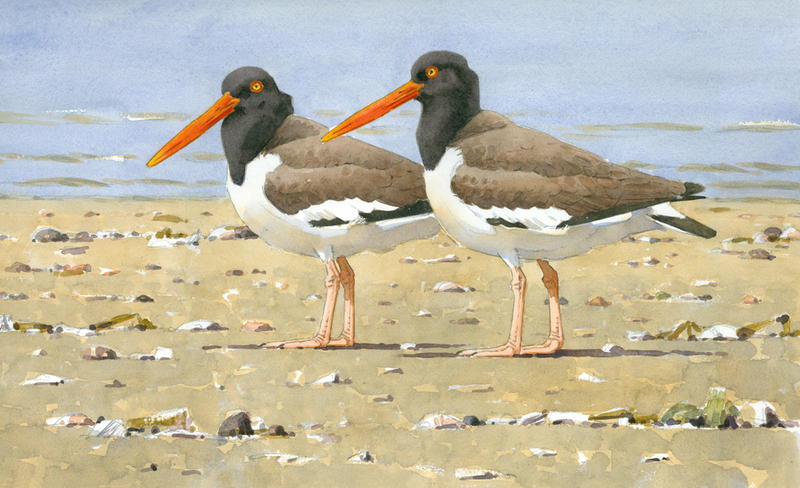 I try some sketching of the Oystercatchers on Sarson’s Island, but they are too far away for meaningful drawing, so I instead take a landscape approach. Four cormorants are perched on a rather odd structure consisting of a cable hanging between two sturdy posts. Later, I learn from director Suzan Bellincampi that the posts and cable were originally erected to encourage egrets to nest, though we couldn’t quite figure out how this rig might have worked! Working at a distance through a telescope has the effect of reducing contrast and softening colors, due to the intervening atmosphere. I hope to retain this effect in my painting, and keep the tones close and subdued. 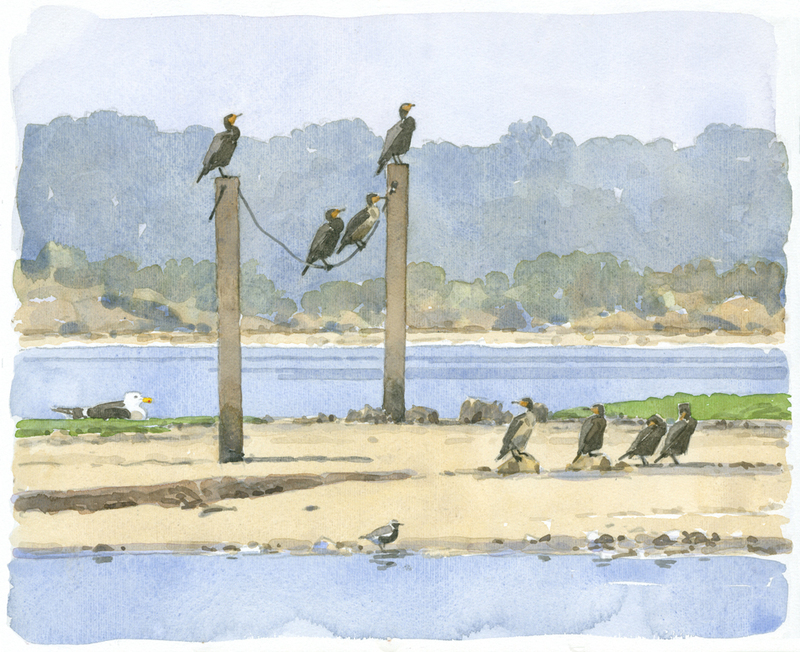 Note that there are three species depicted in this watercolor: double-crested cormorant, black-bellied plover and great black-backed gull. 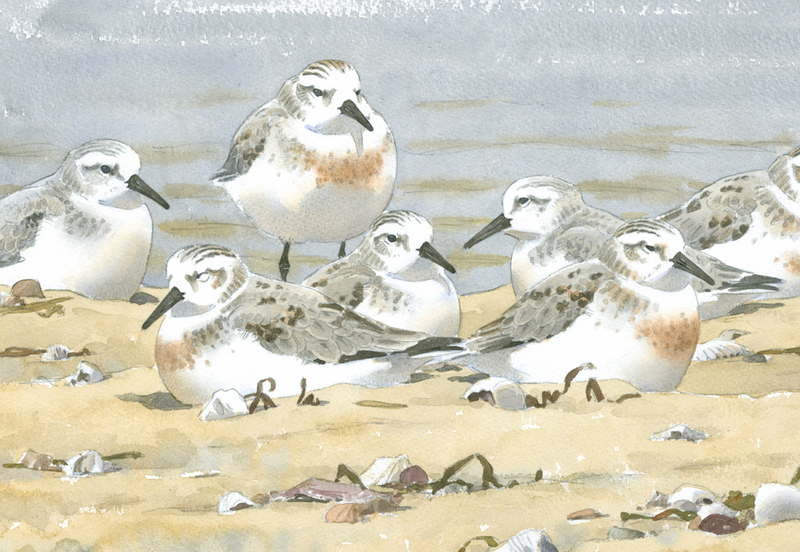 One of my champions, John Busby of Scotland, often did scenes like this with multiple species, and I was thinking of him as I worked on this painting. One tricky aspect here is keeping the various species in proper scale to one another. 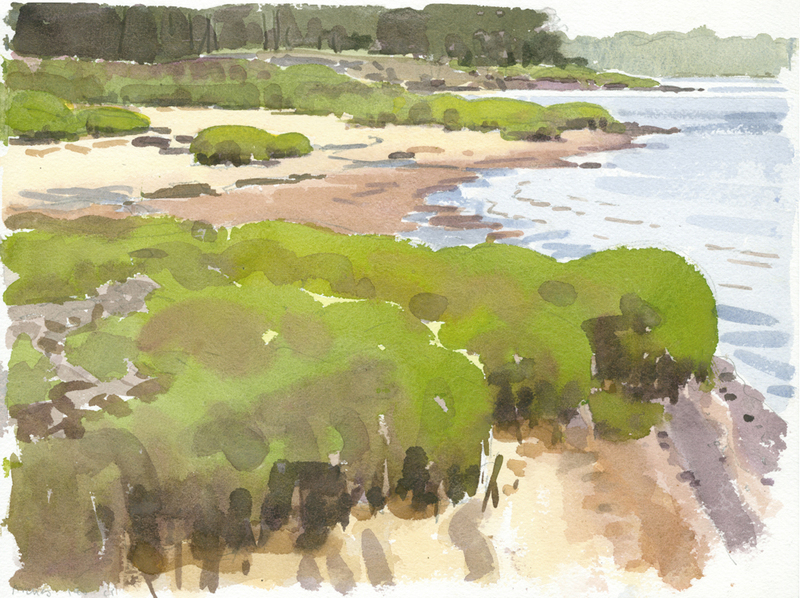 I continue along the shore on the Marsh Trail, pausing to draw some bayberry twigs heavy with those waxy, silvery gray berries. The thick, shiny leaves curl at the edges, and have other slight undulations that catch the light – making them challenging to draw and paint. 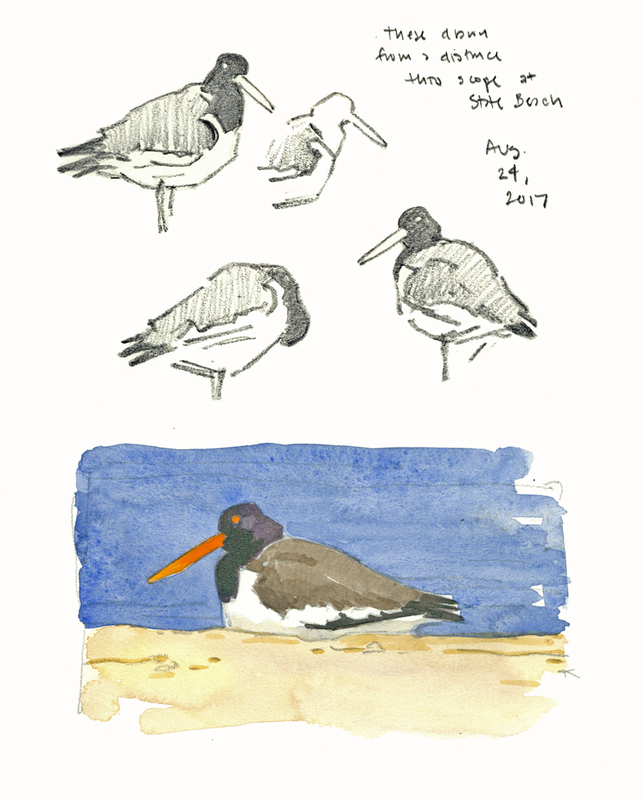 Further along the shore, I finally get a close look at an Oystercatcher – a single bird with a crippled (right) leg, which dangles uselessly as it hops along the shore. 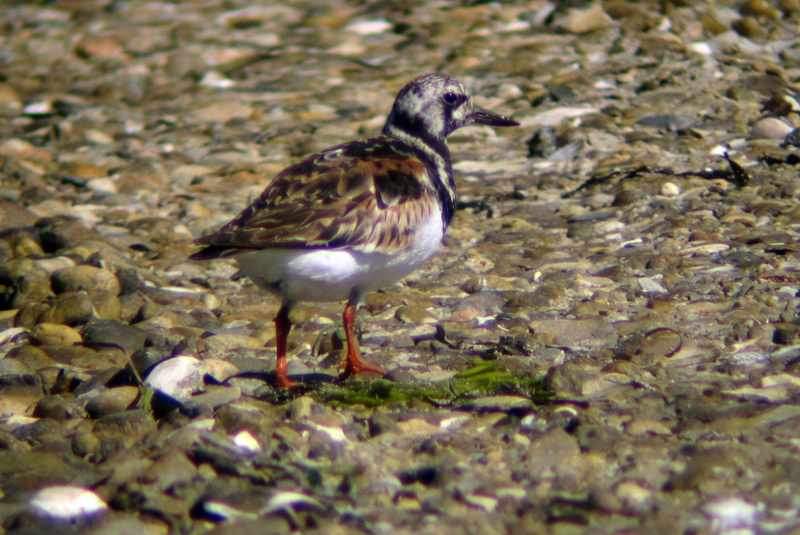 The bird is well-known to sanctuary staff, who have been observing it for weeks. 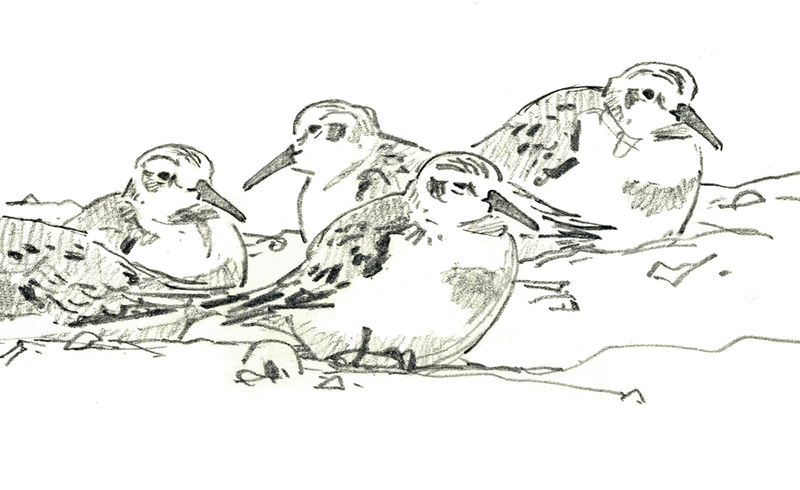 Its plumage is unkempt, probably due to the difficulty of preening while balancing on one leg, but otherwise the bird seems to be getting along. The views along the shore are alluring, with their lush green tufts of marsh grass interspersed with bright little sand beaches – all surrounded by the sparkling waters of Sengekontacket Pond. 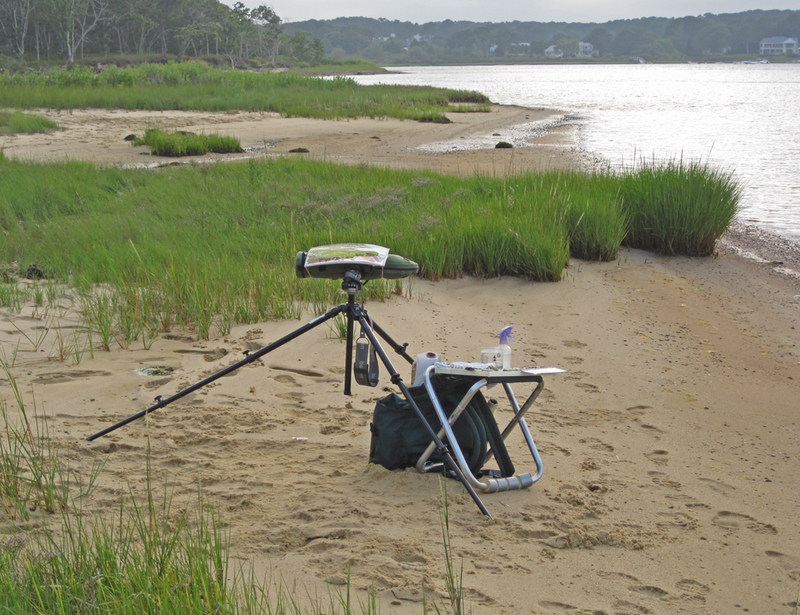 I start a watercolor near the terminus of the Shad Trail, looking up into the protected waters of Majors Cove (I’m now on the westernmost shore of Felix Neck). I paint until the light starts to fade, then head back to the car. 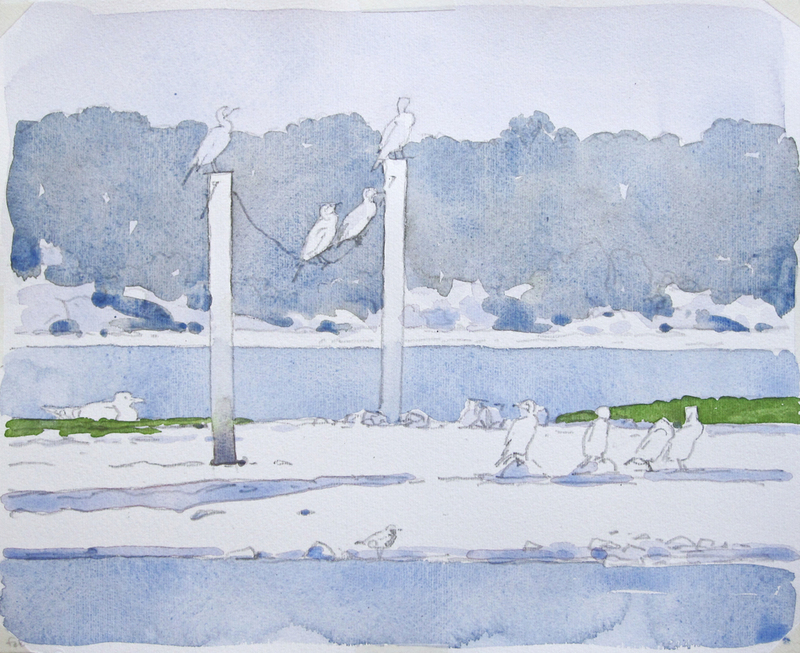 This entry was posted in Artists, Barry Van Dusen Residency, News and tagged Arches 300lb cold-press, Barn Owls, Barry Van Dusen, black-bellied plover, Bourne Rotary, double-crested cormorant, Felix Neck, Ferry, Final Posts, Great Black-backed Gull, Great Egret, huckleberry, Joseph Sylvia State Beach, Marsh Trail, oystercatcher, Sengekontacket Pond, Sharks, Traffic, Woods Hole on December 7, 2017 by Barry V..